Results: To settle down on the surface of titanium dioxide, oxygen atoms need a few electrons. The source of these electrons has been under debate: do the electrons come from the surface or from deep down within? Now, scientists from Pacific Northwest National Laboratory have proven that the electrons come from the surface of the titanium dioxide. The needed electrons are left by oxygen atoms that pack up and move to other locations. 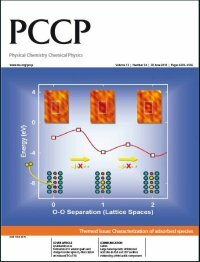 This research was featured on the inside cover of the themed issue on characterizing absorbed species in Physical Chemistry Chemical Physics. Why it matters: It is often said that understanding is the first step in controlling. This advice applies to habits you want to change and chemical reactions you want to control. So, to control a reaction that converts plant matter into fuels, researchers must first understand it. That's what this study does. It provides understanding. The factors that determine whether or not oxygen will bond with a surface is vital to controlling reactions for converting biomass to fuels, treating waste, and purifying water, among other reactions. 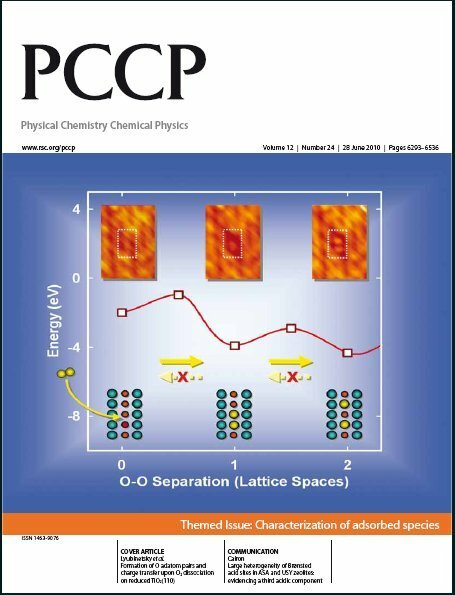 This research shows the vital role oxygen vacancies play in supplying electrons to form bonds between a metal atom from the catalyst substrate and introduced oxygen. 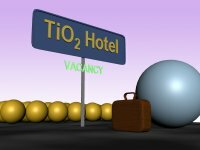 Methods: To determine the source of the electrons needed to bond oxygen to the surface of titanium dioxide, the research team drew together experts in experimentation and theory. The researchers began with titanium dioxide because, in addition to being a common catalyst, is a model metal oxide, typically used in these studies. To see the surface of titanium dioxide, imagine rows of neatly ordered pool balls. These are the titanium atoms. Now, arrange another row on top. The spheres rest between the others. This new row is the oxygen atoms. Using scanning tunneling microscopy, the team followed the behavior of oxygen atoms at specific locations on the titanium dioxide's surface. "Being able to watch the same location over time was key," said Dr. Igor Lyubinetsky, a chemist at Pacific Northwest National Laboratory who led the study. With the data from the microscope and other resources, the team did detailed density functional theory calculations. They determined that when molecular oxygen or O2 reacts with titanium dioxide's surface, the oxygen dissociates into two adatoms, or charged oxygen atoms. These atoms use the electrons from the vacancies to bond on top of titanium atoms on the surface. Then, repulsive Coulombic forces cause the bonded oxygen adatoms to move apart quickly. The future: Next, the researchers are investigating how oxygen physisorbs or weakly interacts with the titanium dioxide at low temperatures. "This is another big mystery out there," said Dr. Zdenek Dohnálek, a key scientist on this research. "And, it is another place where STM [scanning tunneling microscopy] could have the answers." Acknowledgments: DOE's Office of Basic Energy Sciences funded this research. The work was done by Yingge Du, Nathaniel Deskins, Zhenrong Zhang, Zdenek Dohnálek, Michel Dupuis, and Igor Lyubinetsky at Pacific Northwest National Laboratory. Scanning tunneling microscopy and high-performance computing resources at EMSL were used in this research. High-performance computing resources at the National Energy Research Scientific Computing Center were also used.